PanARMENIAN.Net - For almost a century, scientists have observed a strange behavior in cancer cells: They prefer a less-efficient pathway to produce energy. While normal cells utilize aerobic glycolysis to use glucose to produce 36 energy-storing adenosine triphosphate (ATP) molecules, most cancer cells, despite the presence of oxygen, switch to anaerobic glycolysis, which only produces two ATPs. Each year more than 9,000 Americans die of melanoma, a type of skin cancer. In the last decade, personalized treatments that target altered BRAF and MEK proteins -- changes found in more than half of people with melanoma -- have extended patient survival by months and even years. But cancer cells can adapt to therapy and outsmart these drugs, sending patients back into a state of illness after apparent recovery. "Over the course of my career, melanoma has gone from a poorly treatable disease to a potentially beatable cancer, although in many cases, only for a limited time. Thus, our work isn't done," says Ronai, senior author of the paper. "Patients are quickly developing resistance to these medicines -- in as little as a few months after starting treatment -- creating a need for new and better targets and therapeutic modalities." Several changes were seen in melanoma cells when LDHA was blocked. These cells switched from ATP-generating aerobic glycolysis to "eating" glutamine -- an amino acid. The authors found that ATF4 drove this process, calling for more amino acids to be taken up by the cell. 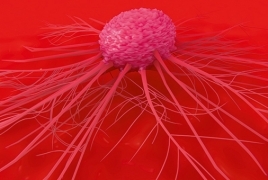 The increase in amino acids activated the master growth regulator, mTORC1, allowing cancer cells to keep growing. Blocking both LDHA and mTORC1 halted cell growth, indicating the therapeutic potential of targeting this pathway. In mapping the alternative route identified upon LDHA inhibition, the investigators point to additional targets that can be exploited, including glutamine metabolism and MAPK signaling, for which pharmacological inhibitors do exist. Adds Pathria, "This study also sheds light on the Warburg effect -- the nearly 100-year-old mystery of why cancer cells prefer an inefficient pathway to fuel their growth. Our results indicate cancer cells crave amino acids, versus ATP. Perhaps these rapidly growing cells find the seemingly wasteful Warburg effect more efficient to gather protein building blocks -- amino acids.